Launching on Friday, July 6 and running through the end of September 2018. Early in his culinary career, Patterson often ate a sandwich made up of bacon, peanut butter, and sriracha. Most nights it would be his dinner headed home on the red line in Chicago. The flavor is a delicious balance of salty, sweet, and spicy, taking him back to the time when his diet mainly consisted of this sandwich, energy drinks, and lattes. 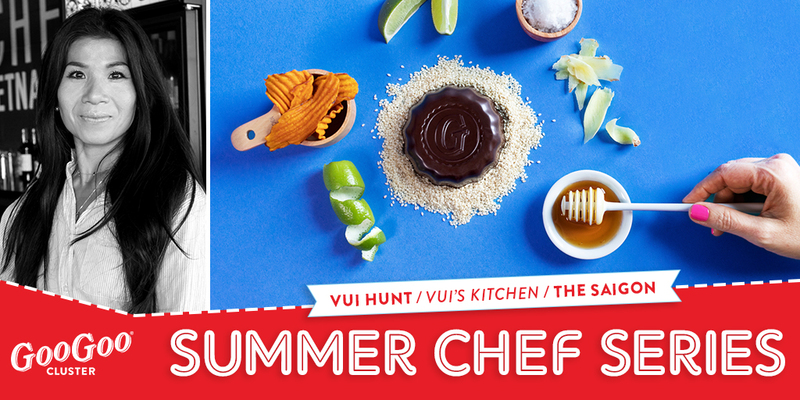 Harkening back to her childhood, Vui’s Kitchen namesake Vui Hunt, designed The Saigon Premium Goo Goo. This modern confection is based on a Vietnamese treat called Bành Ràng that reminds Hunt of sweet times with her father. All the flavors of lime, honey, ginger, and sea salt in The Saigon bring her back to days in Saigon and Central Vietnam. 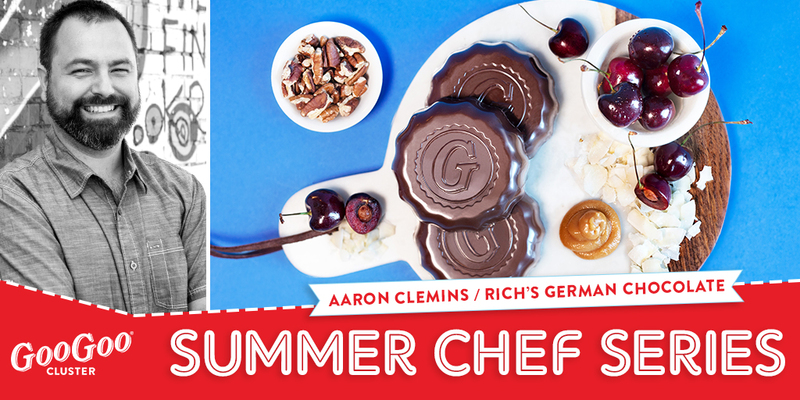 Growing up in Wisconsin, Chef Aaron Clemins remembers pining over the treats at Rich's Cake Shop in Milwaukee trying to select his birthday cake—yet every year Clemins couldn't resist choosing the German Chocolate with cherries! This fond memory of flavor is packed into each bite of the Rich's German Chocolate Premium Goo Goo he designed. Did you know Hanover, Pennsylvania is known as the snack food capital of the U.S.? Josephine’s chef Andy Little is well aware of the fun fact because it’s his hometown! 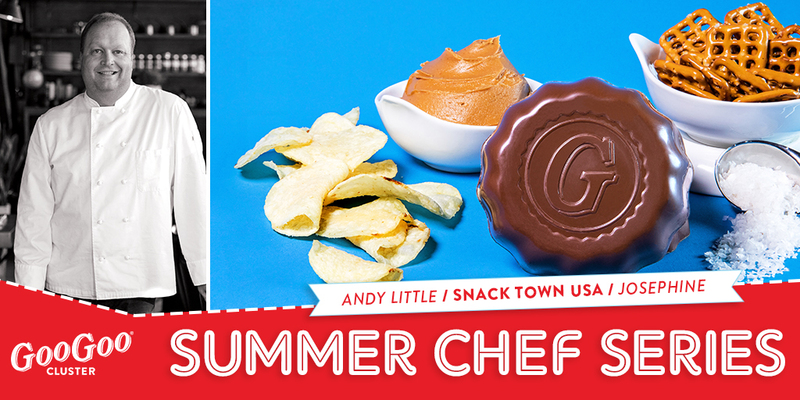 When designing his Snack Town USA Premium Goo Goo, he packed in favorites like Utz Quality Foods potato chips and Snyder’s of Hanover pretzels for a salty, crunchy, chocolatey delight. The Snack Town USA Premium Goo Goo features dark chocolate covered Utz potato chips, peanut butter and Snyder’s pretzel filling, and salted caramel, all covered in milk chocolate with a sea salt sprinkle on the base. When peaches are your favorite fruit it makes perfect sense to incorporate them into your custom Goo Goo Cluster. 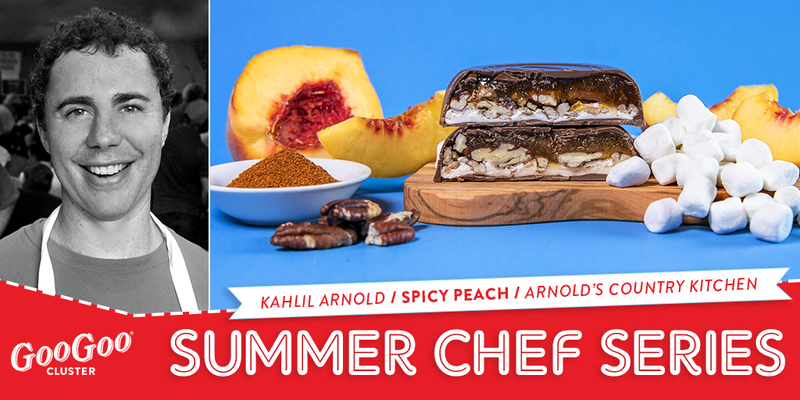 Kahlil Arnold couldn’t resist including this sweet southern flavor into his Summer Chef Series premium, the Spicy Peach. As for the spice, that comes from Arnold's Country Kitchen famous spicy chocolate pie—spicy but not too much, more of a slow burn... >>> Get yours while they last! Nashville natives Jessica Benefield and Trey Burnette found creating their own signature candy with their hometown's iconic brand to be a pretty sweet experience. In the Miso Crunchy Premium Goo Goo, the chefs bring attention to ingredients from their Japanese-inspired restaurant. 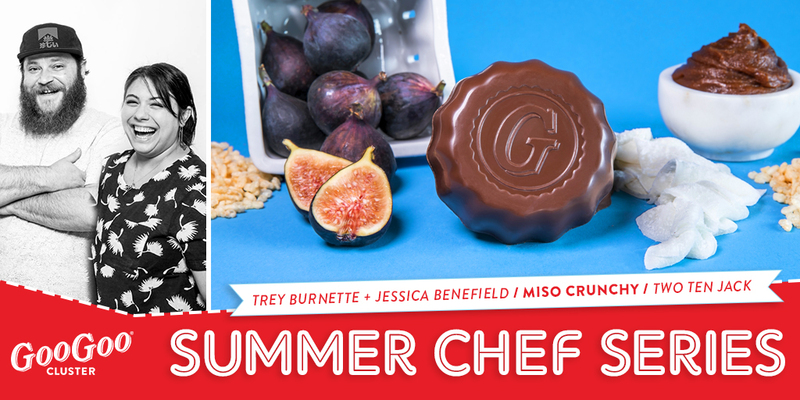 The candy collaboration features fun and chewy mochi, gooey sweet figs, and a miso caramel with crunchy rice crispy and milk chocolate. >>> Get yours while they last! 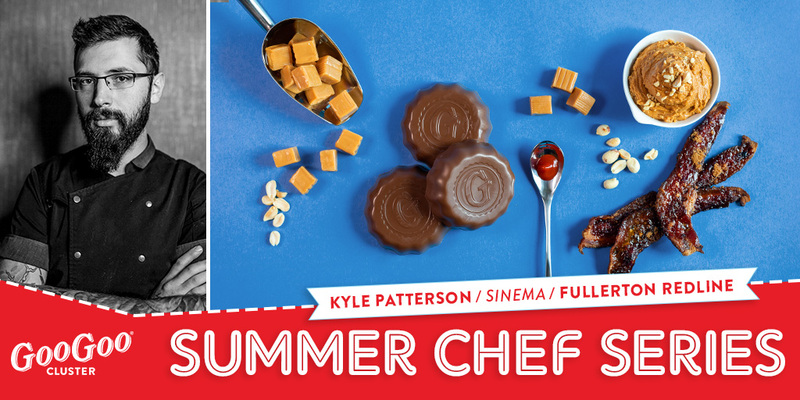 During the Summer Chef Series, each participating chef collaborates with Bethany Halliger, the Goo Goo Shop’s pastry chef, to bring to life his or her own dream Goo Goo. These imaginative confections will be available for purchase at the Goo Goo Shop in downtown Nashville and online at googoo.com. In addition, some of the chefs’ own restaurants will feature their creations for a limited time on dessert menus or as a grab-and-go item. Flavors will rotate throughout the 12-week series, with a new chef flavor being released every two weeks, and available for purchase for at least four weeks. Each new Premium Goo Goo will be released on @GooGooClusters social media channels and on googoo.com, make sure you're following along for the latest launch. To wrap up the series, Goo Goo will showcase all of the chefs’ flavors at Music City Food & Wine Festival on September 14 and 15, 2018. Hope to see y'all there!